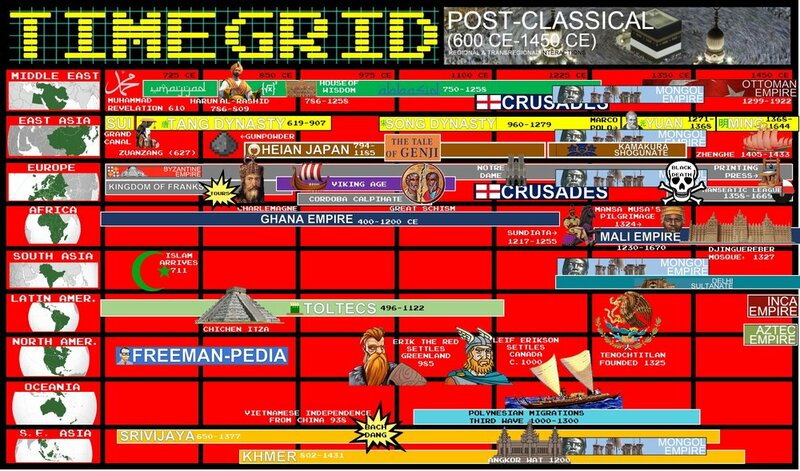 KC 3.1: A DEEPENING AND WIDENING OF NETWORKS OF HUMAN INTERACTION WITHIN AND ACROSS REGIONS CONTRIBUTED TO CULTURAL, TECHNOLOGICAL, AND BIOLOGICAL DIFFUSION WITHIN AND BETWEEN VARIOUS SOCIETIES. 1. Improved transportation technologies and commercial practices led to an increased volume of trade, and expanded the geographical range of existing and newly active trade networks. C. The growth of inter-regional trade in luxury goods (silk and cotton textiles, porcelain, spices, precious metals and gems, slaves, exotic animals) was encouraged by significant innovations in previously existing transportation and commercial technologies--including caravanserai, compass use, the astrolabe, larger ship designs in sea travel--and new forms of credit and the development of money economies (Bills of exchange, Credit, Checks, Banking Houses, Use of Paper Money). E. The expansion of EMPIRES facilitated Trans-Eurasian trade and communication as new peoples were drawn into their conquerors’ economies and trade networks. B. 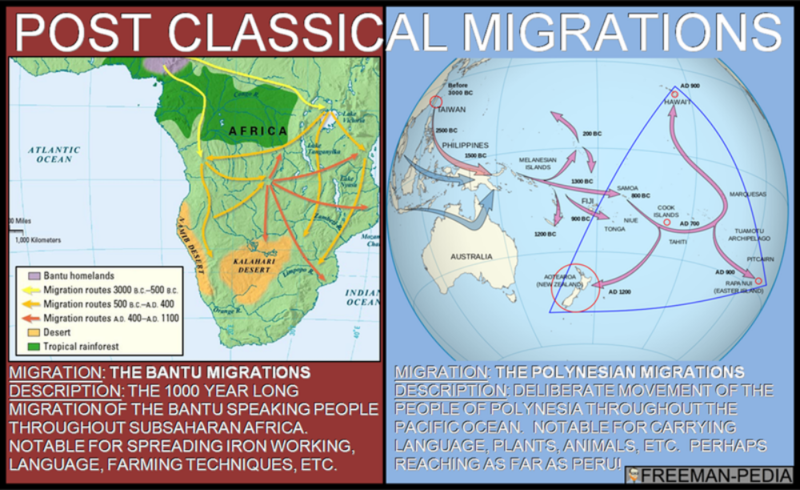 Some migrations had a significant environmental impact, including the migraiton of Bantu speaking peoples who facilitated transmission of iron technologies and agricultural techniques in Sub-Saharan Africa, as well as the maritime migrations of the Polynesian peoples who cultivated transplanted foods and domesticated animals as they moved to new islands. Bantu Migrations from Jared Diamond. C. Some migrations and commercial contacts led to the diffusion of languages (spread of Bantu languages including Swahili, Spread of Turkic and Arabic languages)throughout a new region or the emergence of new languages. A. Islam, based on the revelations of the Prophet Muhammad (pbuh), developed in the Arabian Peninsula. The beliefs and practices of Islam reflected interactions among Jews, Christians, and Zoroastrians with the local Arabian Peoples. Muslim rule expanded to many parts of Afro-Eurasia due to military expansion, and Islam subsequently expanded through the activities of merchants, missionaries, and Sufis. B. In key places along important trade routes, merchants set up diasporic communities (Muslim merchant communities in the Indian Ocean region, Chinese merchant communities in Southeast Asia, Sogdian merchant communities throughout Central Asia, Jewish communities in the Mediterranean, Indian Ocean Basin, or along the silk roads)where they introduced their own cultural traditions into the indigenous culture. C. As exchange networks intensified, an increased number of travelers within Afro-Eurasia wrote about their travels (Ibn Battuta, Marco Polo, Xuanzang). IV. There was continued diffusion of crops and pathogens, including epidemic diseases like the bubonic plague along trade routes. B. In some places, new political entities emerged, including those developed in various Islamic states, the Mongol Khanates, new Hindu and Buddhist states in South, East, and Southeast Asia; city-states (Italian Peninsula, East Africa, Southeast Asia), and decentralized government (feudalism) in Europe and Japan. D. In the Americas, as in Afro-Eurasia, state systems expanded in scope and reach; networks of city-states flourished in the Maya region and, at the end of this period, imperial systems were created by the Mexica (“Aztecs”) and Inca. II. Inter-regional contacts and conflicts between states and empires encouraged significant technological and cultural transfers. Changes in trade networks resulted from and stimulated increasing productive capacity, with important implications for social and gender structures and environmental processes. Productivity rose in both agriculture and industry. Rising productivity supported population growth and urbanization but also strained environmental resources and at times caused dramatic demographic swings. Shifts in production and the increased volume of trade also stimulated new labor practices, including adaptation of existing patterns of free and coerced labor. Social and gender structures evolved in response to these changes. B. Demand for luxury goods increased in Afro-Eurasia. Chinese, Persian, and Indian artisans and merchants expanded their production of textiles and porcelains for export; industrial production of iron and steel expanded in China. More than one city "declined" because the Vikings "visited". Many, many cities are gone because of these guys. The Little Ice Age is tied directly to the decline in urban population. A. The diversification of labor organization that began with settled agriculture continued in this period. Forms of labor organization inluded free peasant agriculture, nomadic pastorialism, craft production and guild organization, various forms of coerced and unfree labor, government imposted labor, and military obligations. C. New forms of coerced labor appeared. The demand for slaves for both military and domestic purposes increased particularly in central Eurasia, parts of Africa, and the Eastern Mediterranean. What's the largest religious monument in the world? You're looking at it. Angkor Wat ("Temple City")'s such a big deal, it's on Cambodia's flag! It began as a Hindu temple to Vishnu, but later became a buddhist temple (which it remains to this day). 50% of every tourist who visits Cambodia, visits Angkor Wat. Two Indonesian airlines offer direct flights just to see this structure. What's the Greatest thing in Zimbabwe? A: Great Zimbabwe. I know what you're thinking, "The other buildings/art in this era are more impressive. But, it was built 5,000 miles south of Europe. It's the second oldest structure in Southern Africa. It once held 18,000 people. The walls are built without mortar! So, don't hate on Great Zimbabwe... It was the seat of one of the greatest kingdoms in Southern Africa. The most powerful Christian state in this era was the Byzantine Empire. In their most famous church (see Hagia Sophia from the last era) they put up a mosaic of Jesus. This is one of many mosaics within the church. This is considered the beginning of the Byzantine Renaissance. If you zoomed out, you would see both John the Baptist and the Virgin Mary. Alhambra ("The Red One") is the most famous piece of Islamic architecture in Spain. It's a palace complex built by the last Islamic dynasty to rule Spain (Nasrid Dynasty 1232-1492). Even Charles V (One of Europe's most powerful people in the next era) built his offices within A beg Lhambra. It actually fell into disrepair before being rebuilt in the 19th Century. Today, it is one of Spain's biggest tourist attractions. Notre Dame is probably the most famous church on earth. From the stained glass to the Flying Buttresses, Notre Dame is an iconic building in the center of Paris. Speaking of Buttresses.... Check out those Buttresses. This was one of the first buildings to use buttresses to displace the weight of the roof outward. Napoleon crowned himself emperor inside. You want relics? How about a piece of the true cross, the crown of thorns, and a nail from the cross? When it comes to cathedrals, this is your best example. OVER HALF OF THIS ERA IS TRADE. OLD TRADE ROUTES EXPANDED AND NEW ONES EMERGED (AND ALL THE LOVELY THINGS THAT COME WITH IT; DISEASE, RELIGIONS, CROPS, PEOPLE). FORGET CLASSICAL PEOPLES, THIS ERA IS DOMINATED BY TWO NEW GROUPS MUSLIMS & MONGOLS. REMEMBER THE ASHES OF THE CLASSICAL PEOPLES; FEUDAL EUROPE, BYZANTINES, & RENAISSANCE CHINA.